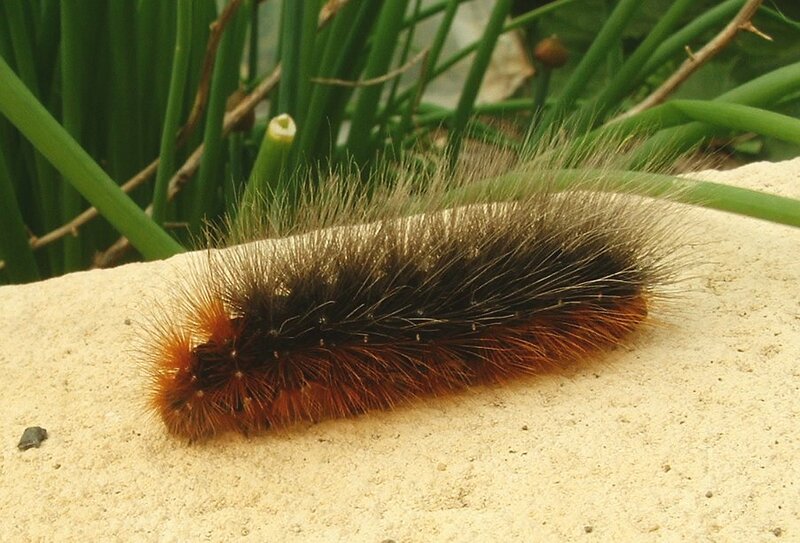 “Writing the recent article about hairy caterpillars of the Oak Processionary Moth reminded me of the brown hairy caterpillars of the Garden Tiger Moth that I was always coming across during my youth. The hairs from these creatures are loaded with histamines and can cause nasty irritations if handled. If more than one is kept together in captivity, they can be cannibalistic (don’t ask me how one can chew the other one without getting a mouthful of those nasty hairs). I haven’t seen any of these hairy monsters (often called “woolly bears”) for many years and there is now real concern that they could become extinct. 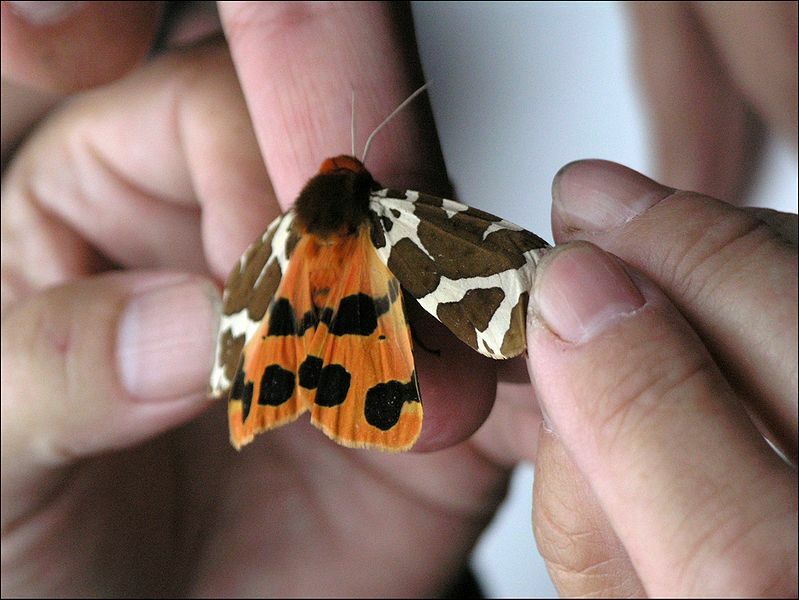 “Butterfly Conservation” has a moth-night each year and this year it is making a particular request for anyone spotting a Garden Tiger Moth during the period from the 8th to the 10th August to report it. More information on National Moth Night can be found here. 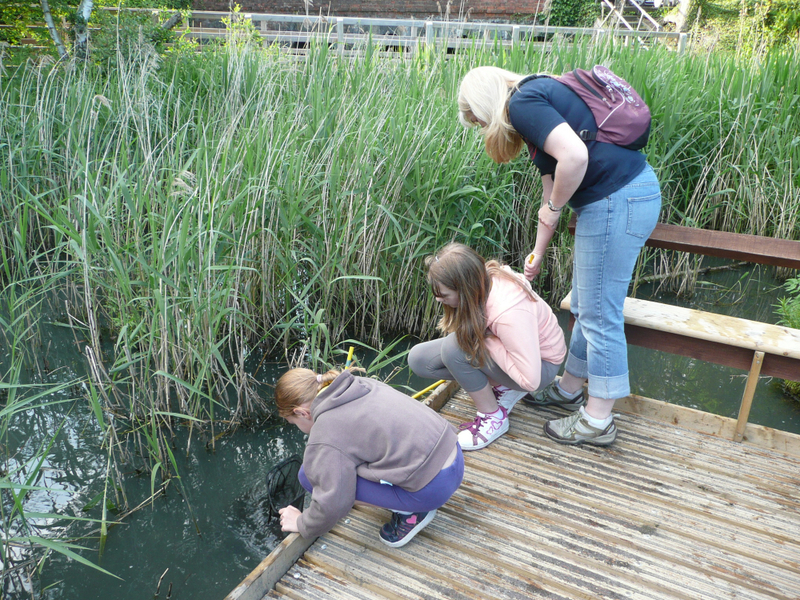 On an evening in early June, a group of 24 Brownies, together with their 3 Leaders, visited Fleet Pond to go bug hunting and pond dipping (see sample pictures above and below). “As part of their Wildlife Explorer badge, on 5th June the girls from 6th Fleet Brownies headed down for a bit of fun at Fleet Pond. 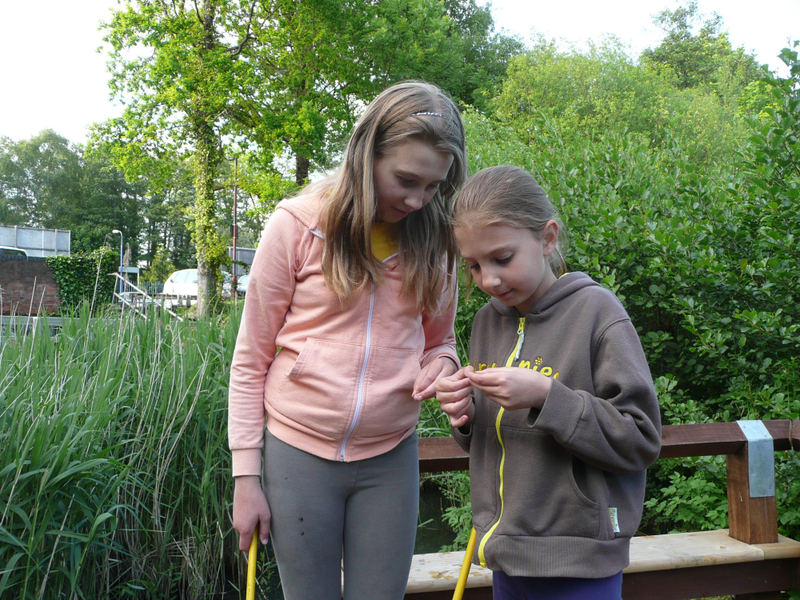 Thankfully we were blessed with a warm and sunny evening, perfect for a spot of bug hunting and pond dipping! They were all eager to get going and soon set too, poking, prodding, lifting and dipping until their bug pots were full and their nets overflowing. 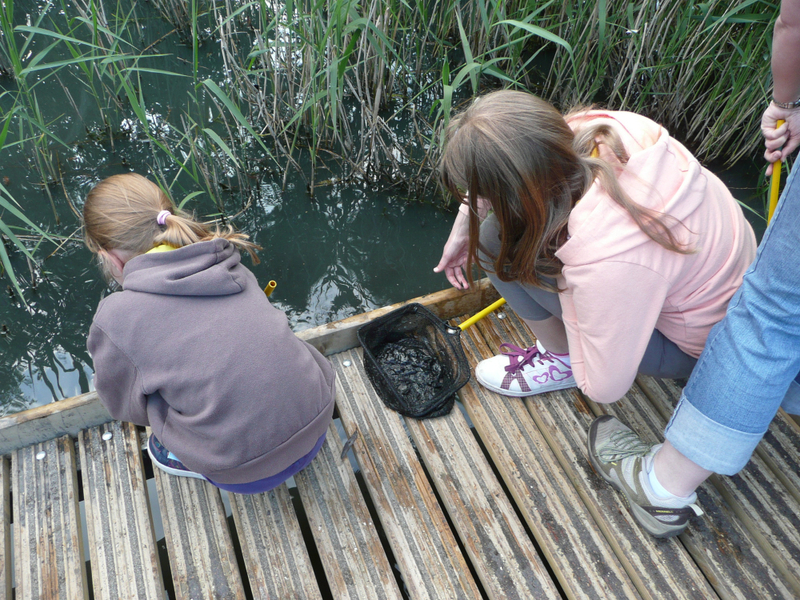 They had a fantastic time and, I’m relieved to say, everyone caught something…even the Leaders! I know the saying goes that little boys love slugs and snails but I can certainly attest that our girls love them too! They also now love weevils, centipedes, water boatmen, worms and backswimmers! It looks like they’ve found something! 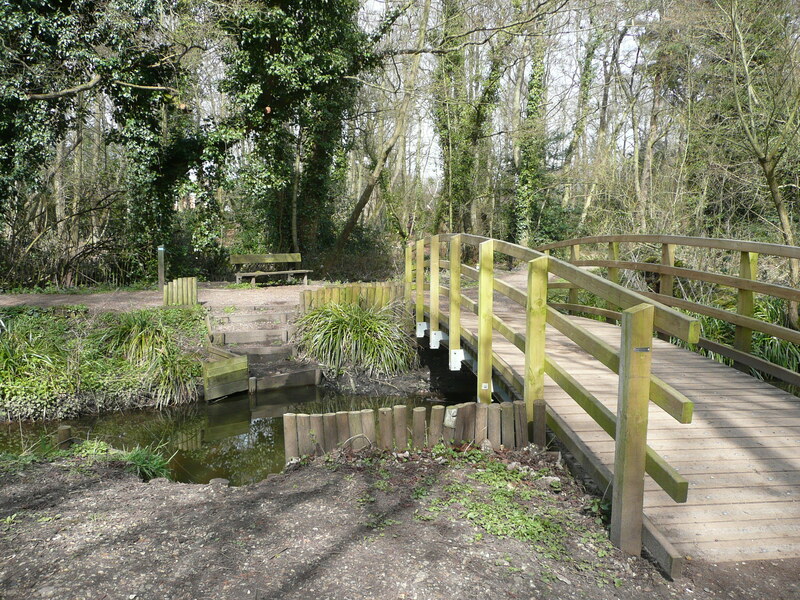 The new dipping platform was sponsored by Fleet Townswomen’s Guild, and built by volunteers from Fleet Pond Society. 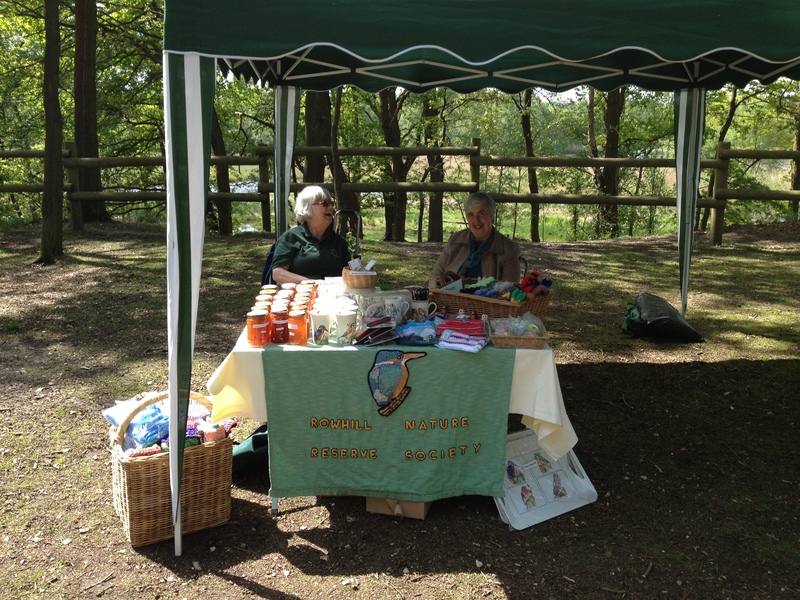 The platform was officially opened by ladies from the Guild at the recent Wildlife Open Day. The platform is situated at the corner of the Pond in the vicinity of the Dimension Data building and Fleet Railway Station (see below). 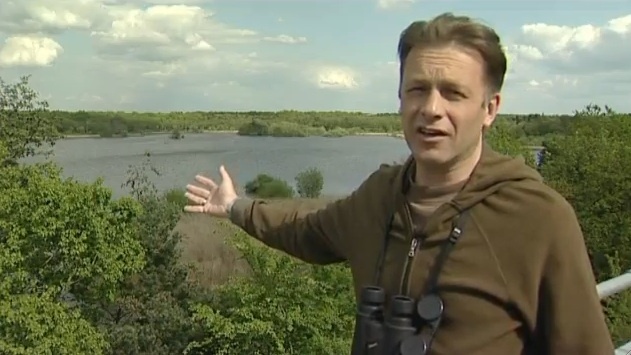 Fleet Pond Society patron, Chris Packham, makes an eloquent plea for individuals to take action, following the recent State of Nature report, in a guest blog post for the RSPB. Sir David Attenborough launched the State of Nature report at the Natural History Museum, London on 22nd May 2013. The report was compiled by 25 wildlife organisations, working alongside scientists, to produce a stock take of Britain’s nature. It revealed that 60% of the species studied have declined in the past 50 years. The full State of Nature report can be found here. “The task for Sunday is a mobile one. 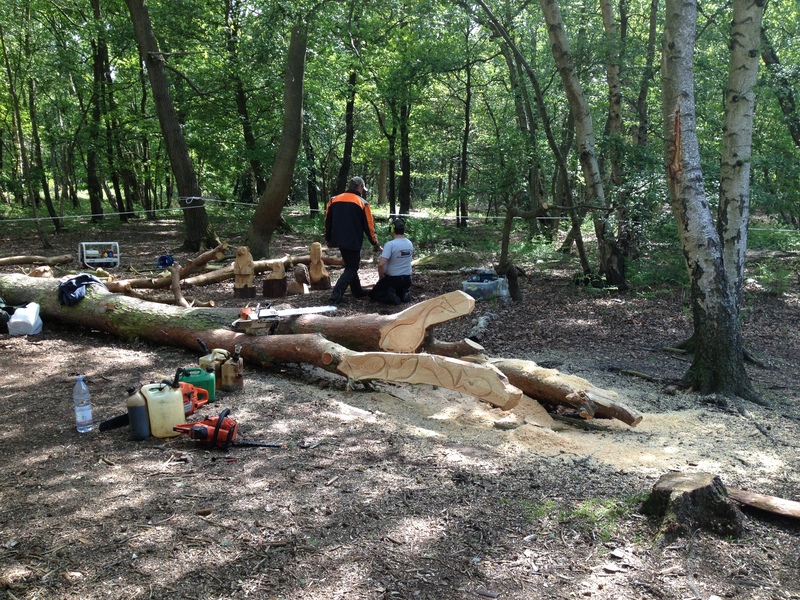 Some work is needed at Boathouse Corner – fitting retaining timbers in preparation for a levelling off of the area by the History Board. There is a pile of hoggin up in the car park which we will use to fill potholes and sunken stretches of the footpath network. The footpath repairs will involve shovelling hoggin, levelling it off and tamping it down. 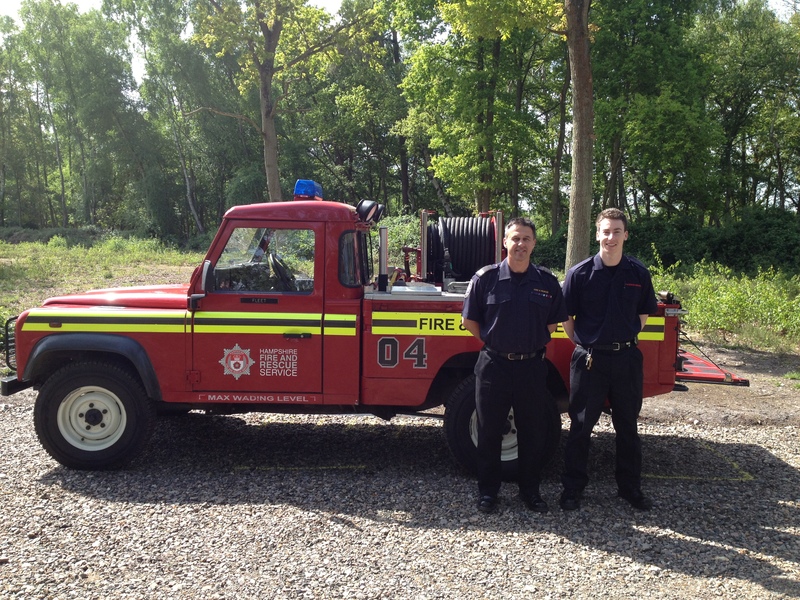 Further details of the Sunday volunteer events can be found here. 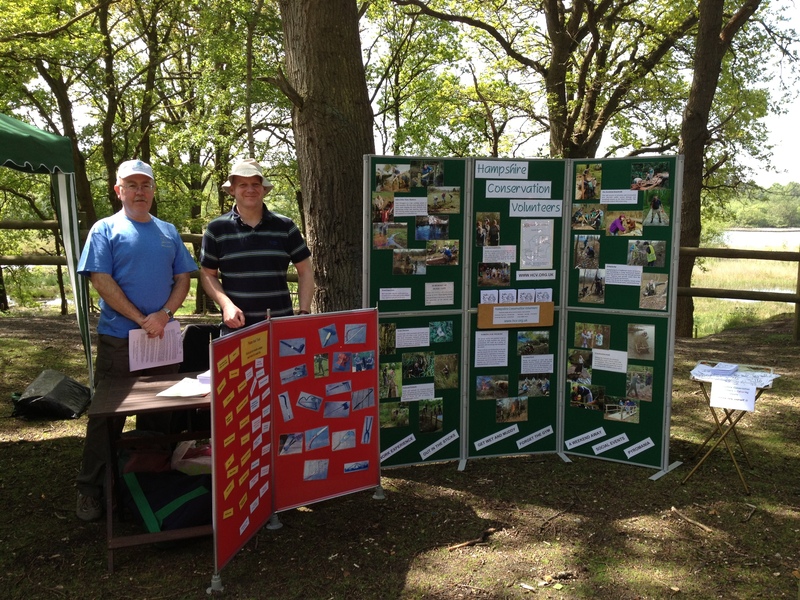 The Wildlife Day at Fleet Pond, organised by Louise Greenwood and her colleagues at Hart Countryside Services, was a big success. 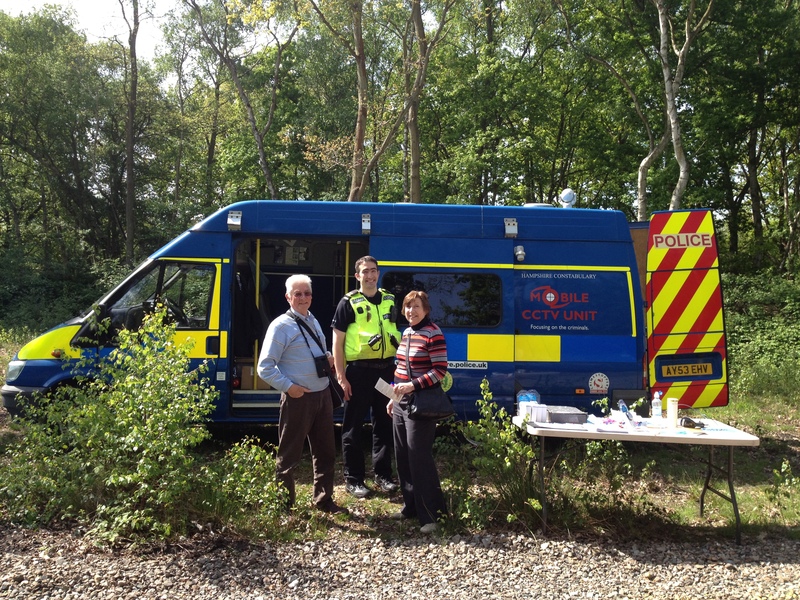 Here are some more photos from the day, showing the wide range of organisations that were involved. A really good community event! Have You Seen The Stew Ponds? 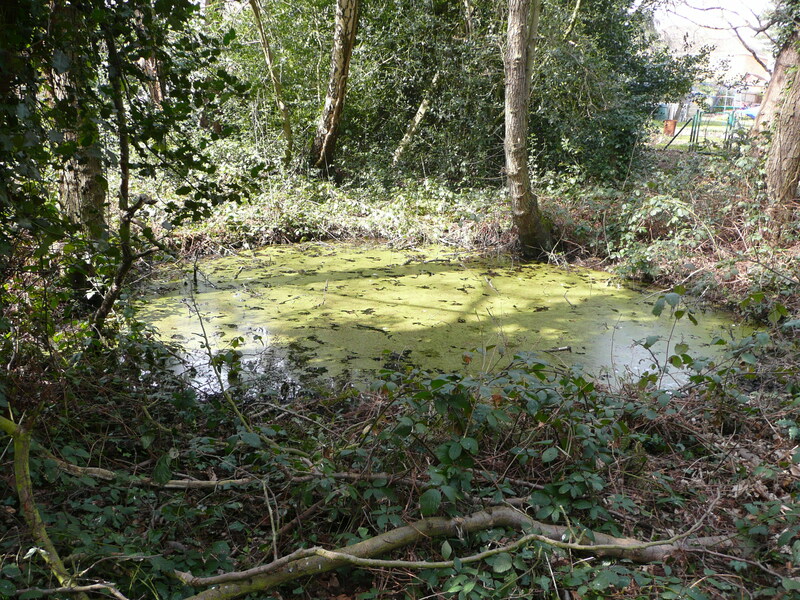 Whilst going for walks round the pond, you may have easily missed the stew ponds! These are small ponds that were historically used to hold fish caught at Fleet Pond prior to being transported to the monks at Winchester. 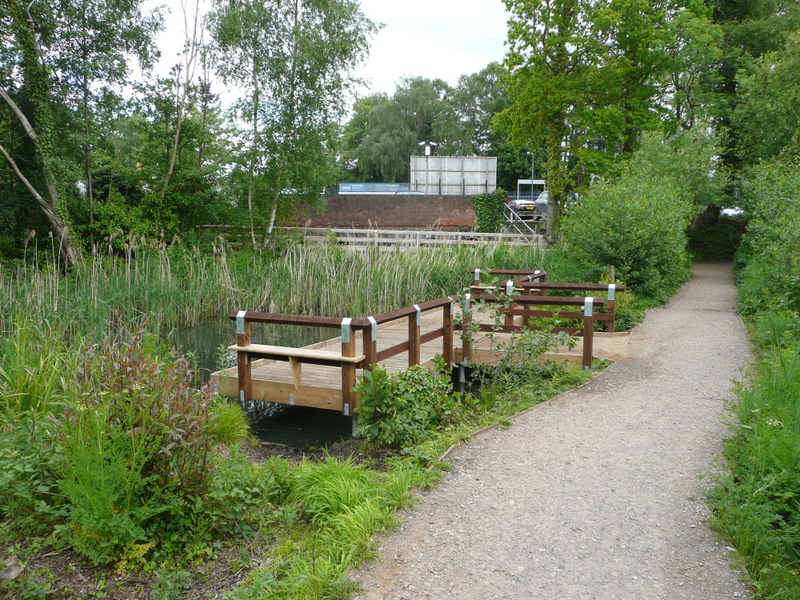 For a good history of the Pond, please see here and a previous post explains how these holding ponds were renewed by conservation volunteers in 2006 as well as more on their interesting history. 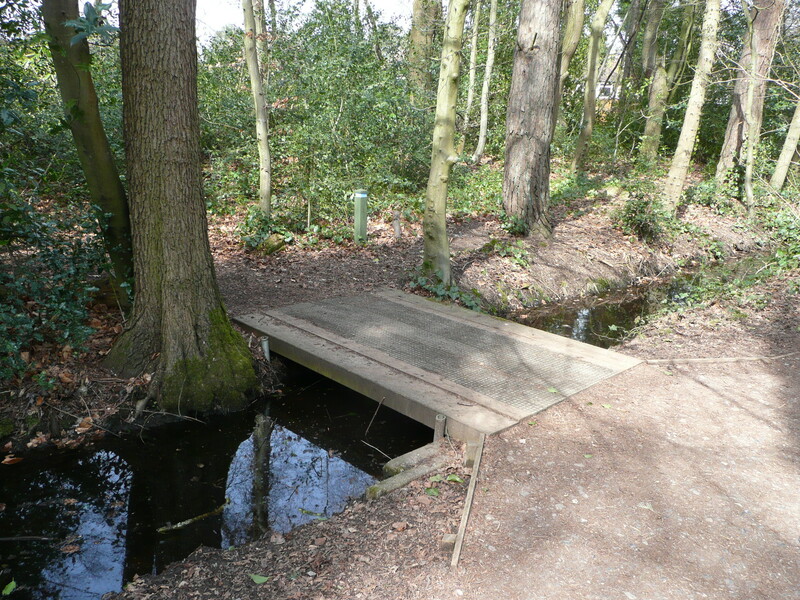 The stew ponds can be found by following the crossing point near Brookly Bridge (see photos below). The path is straightforward and the walk will only take 5 minutes, so it’s worth giving it a try! You are currently browsing the Fleet Pond Blog blog archives for June, 2013.